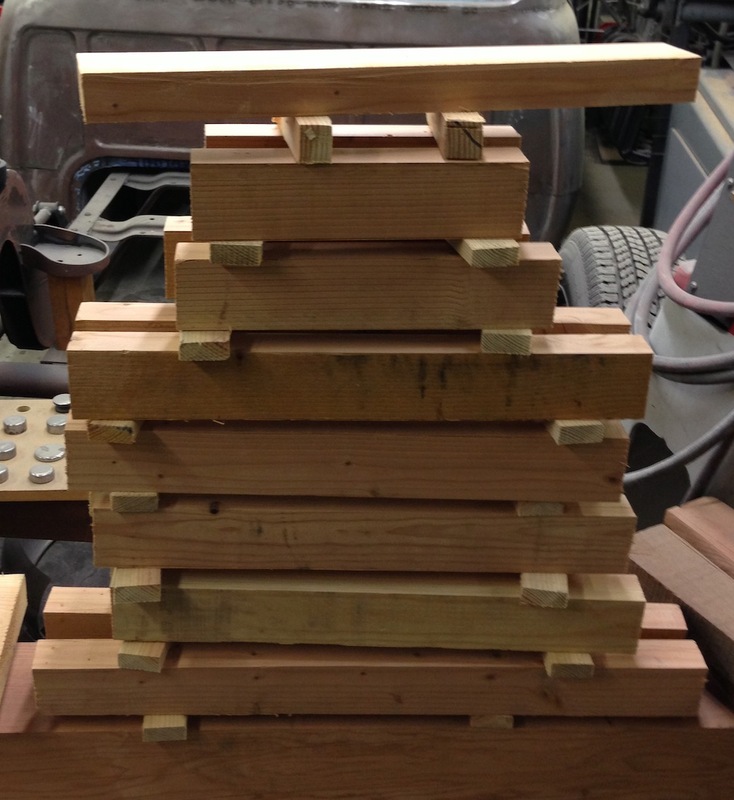 So, I have to cut 16 mortises, 3/16″ wide by 3/4″ long by 1/2″ deep in the 3/4″ square stiles for the Blacker House style sconce I’m making. I did a few experiments with chopping these by hand and it’s too slow and fussy for my current skills. I need to practice more, but I also want to get this light made. 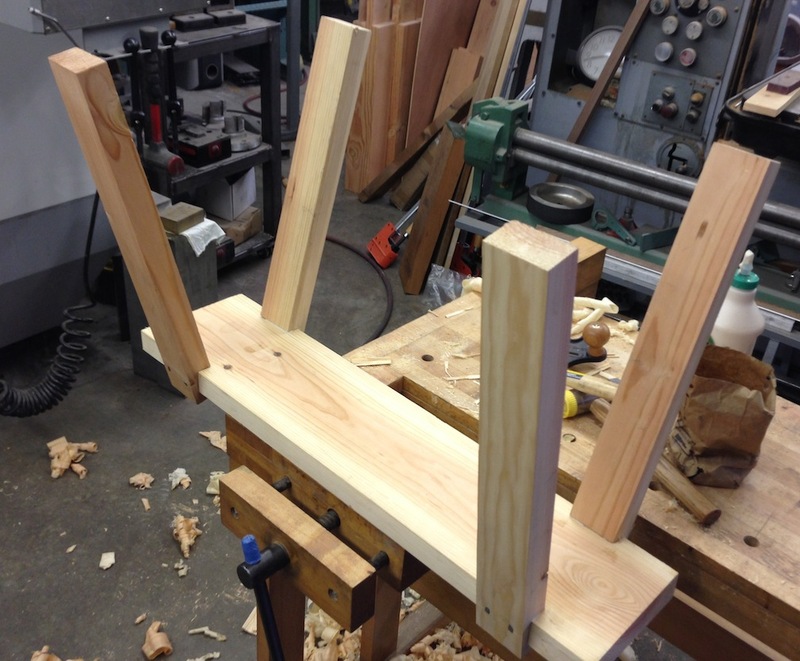 So I decided to set up a simple router table to crank these mortises out. 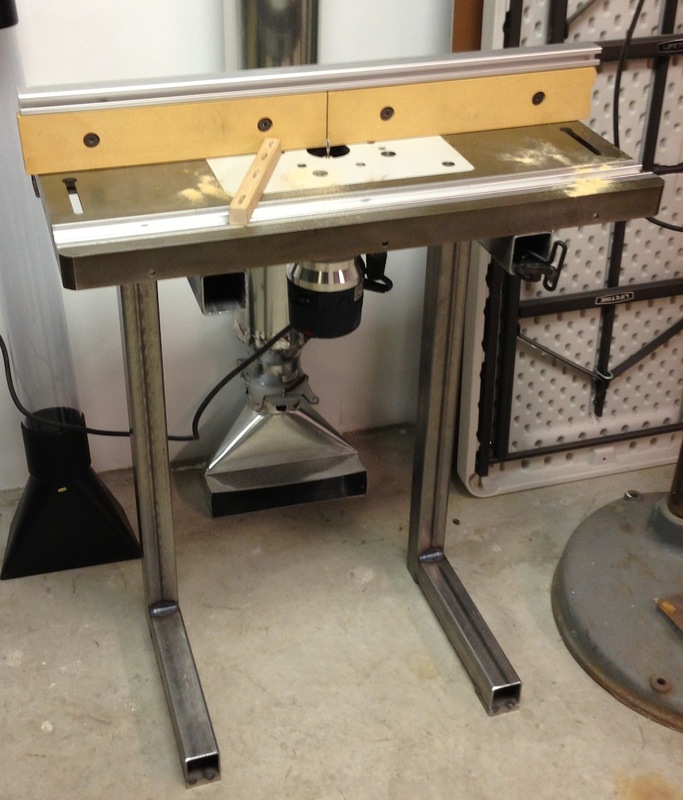 Step one, I started scrounging on craigslist for a ready-to-go router table. I don’t want (or need) another project. I found a few for sale including a nice Jessem setup, but they were all way more money than I wanted to spend on something like this. Several folks were selling the typical particle board and Formica tops with the plastic insert on 2×4 legs – for hundreds of dollars. Not my cup of tea. 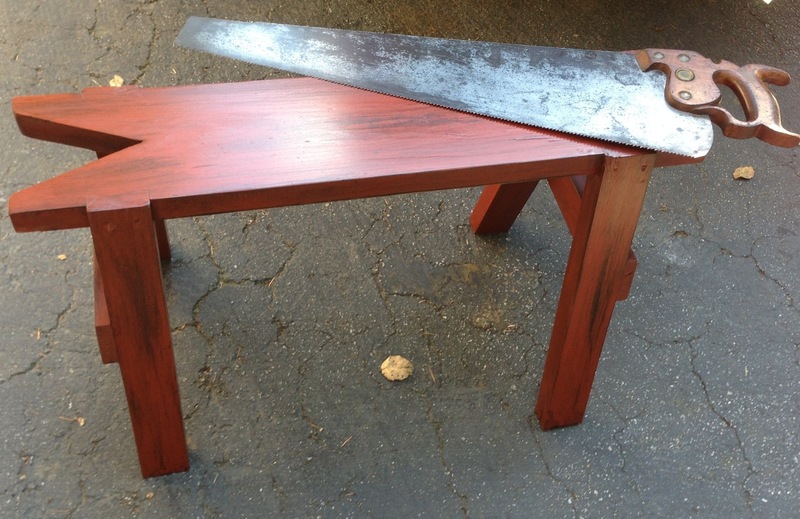 I was on the verge of making one from scratch when I found a guy selling a Bosch 1617 router and a steel Bench Dog table top. This is a steel top that it meant to attach to the left side of a standard table saw. It won’t work with my saw, but a router right there would be in the way after all (which is why this one was for sale). I started with a simple sketch. I thought about making a cabinet base out of plywood, with drawers for bit storage and so forth. 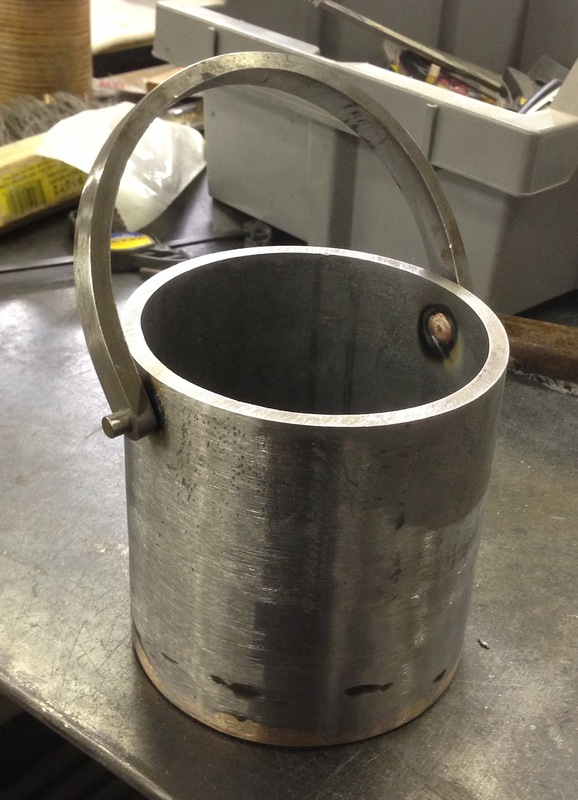 But I also wanted to just get this done and operational so I could get on with my sconce project So I decided on a fabricated steel stand. 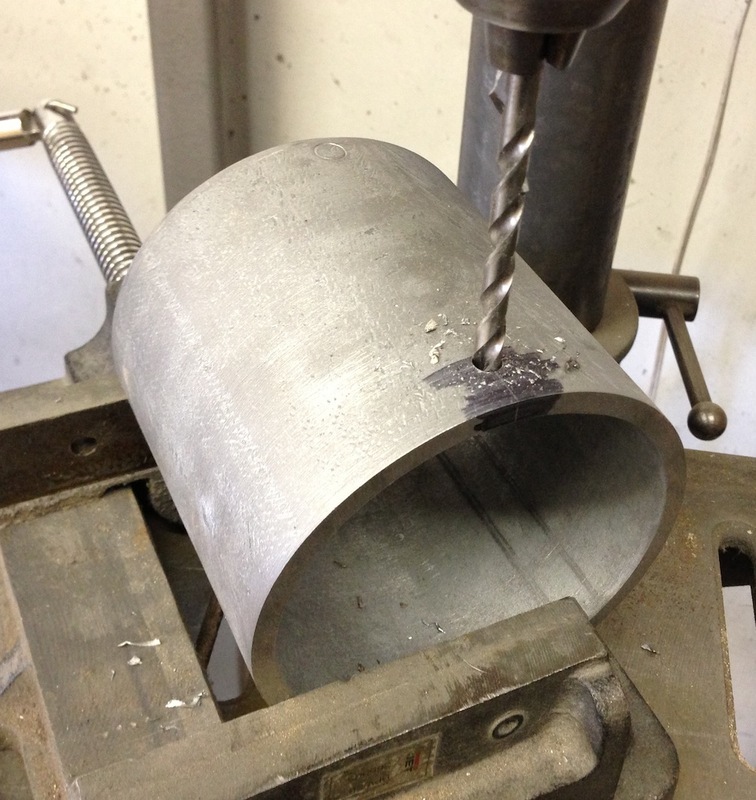 I had some 2″ square tube on hand, so I cut app the pieces and de-burred it. Then went at it with the welder. 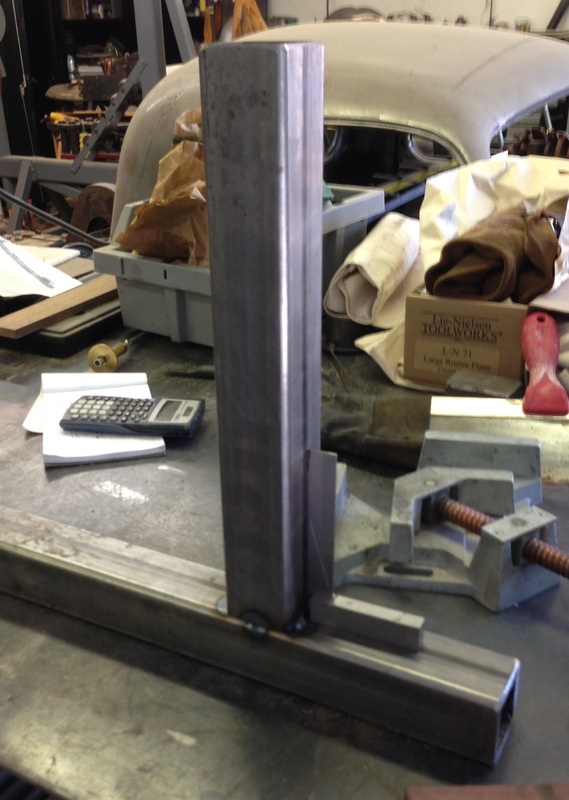 I tack welded all the parts and triple checked to make sure they were square. 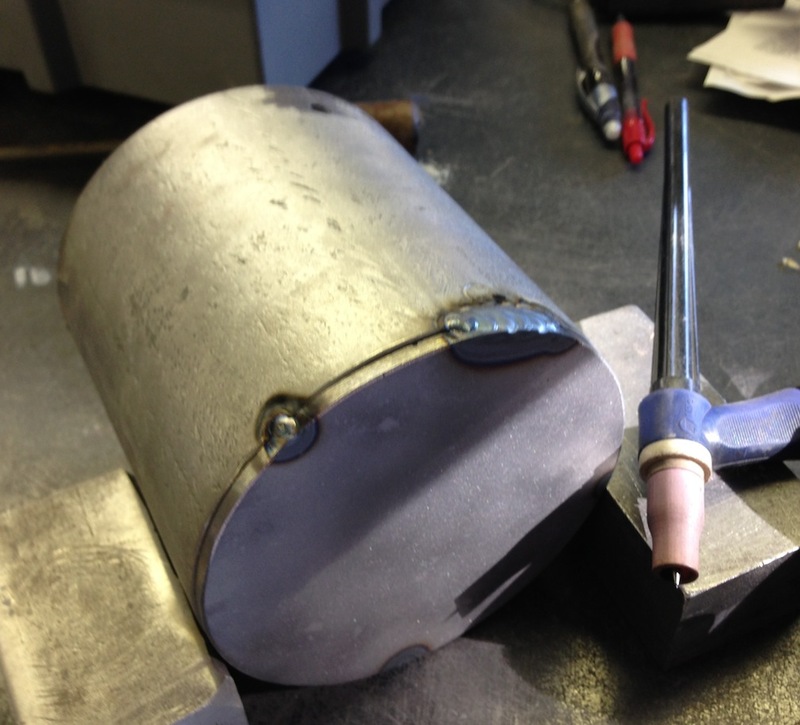 The heat from welding will easily pull parts out of alignment, and in a few cases I chose where the next weld went to pull parts back into alignment. 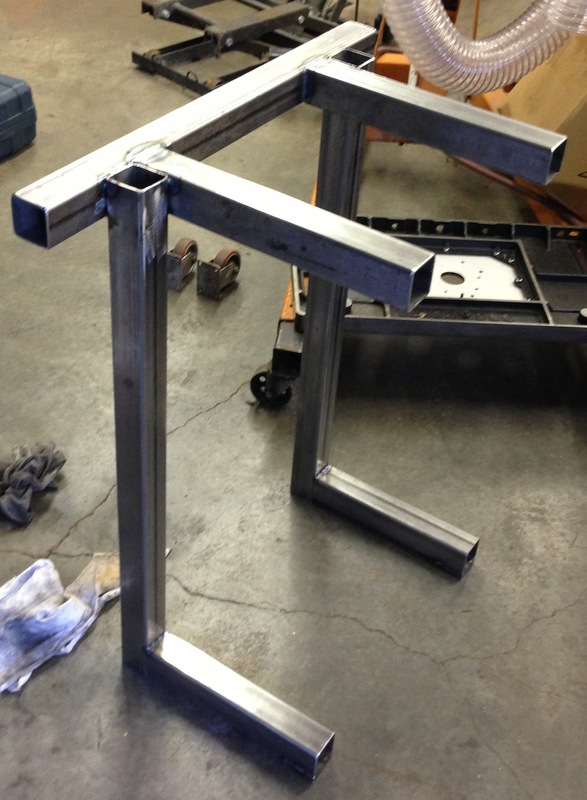 I took about an hour and a half to cut the tubing and weld up the stand. I don’t think I could have made this in wood any faster. I added two tabs to the back to bolt the steel top in place using two of the existing holes for mounting it to a table saw. 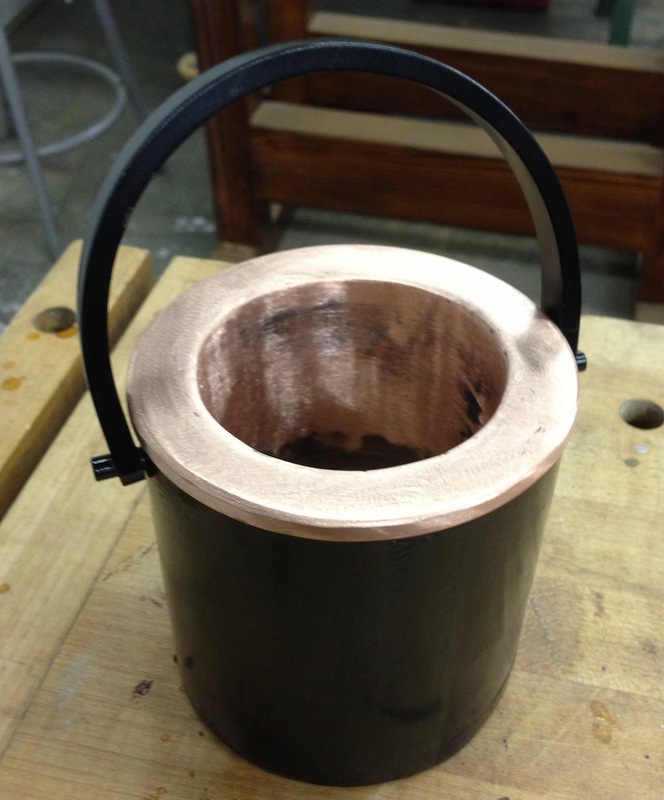 The top is completely support by the steel tubing, the tabs just provide the attachmant to keep it in place. In place in the wood shop. I made some practice cuts and the mortises are prefect. Time to do the real parts now. 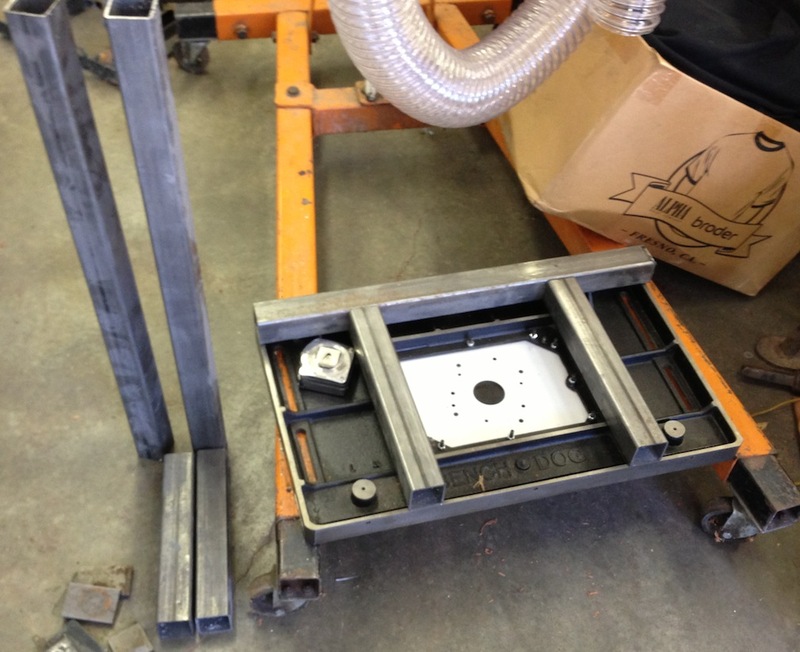 It’s simple and even with the steel base and top I can easily pick this up and move it around the shop. I made it the same height as the table saw, so I can press it into service as an out feed support if necessary, although I plan to make a dedicated support soonish. I need some way to store the extra router bits and wrenches, but I’ll deal with that another day. I’ll need to add dust collection for this eventually. 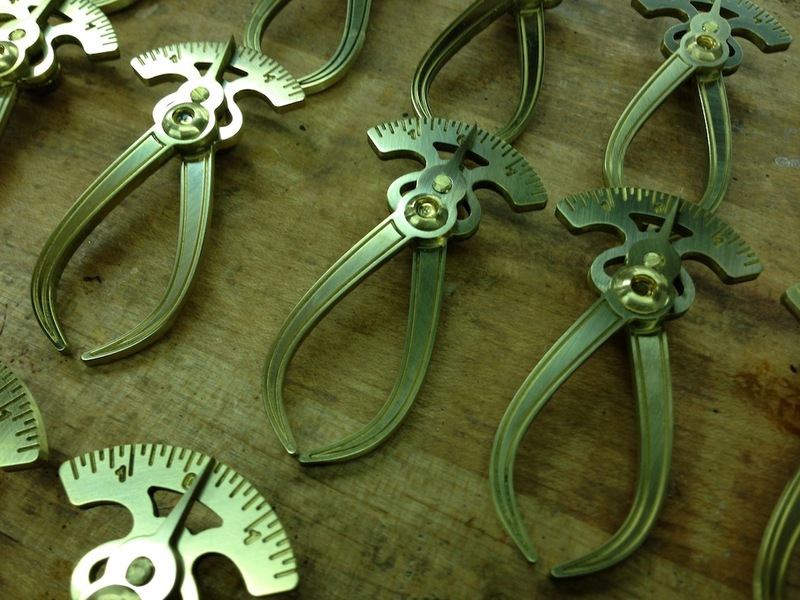 A while back Christopher Schwarz asked if I could make a batch of the Studley Calipers for Lost Art Press, it took me a while to get going on it with all the commotion at work but I finished them up this week. 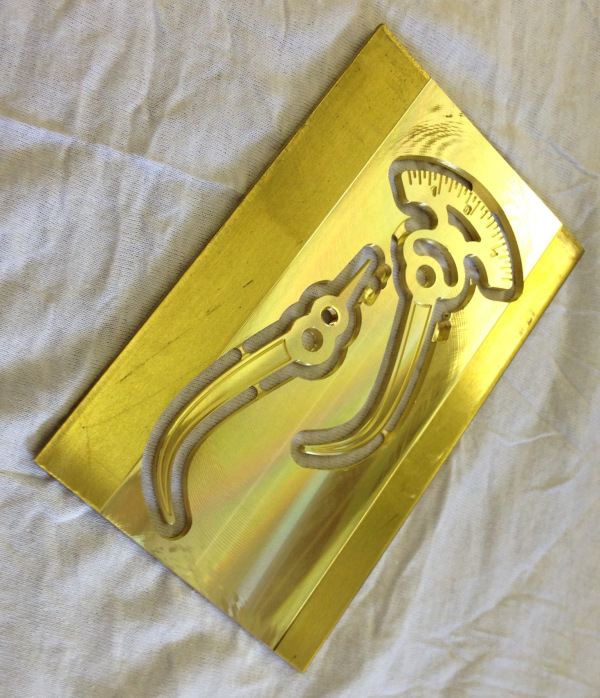 I blogged about this before, I started with a picture and scaled it in SolidWorks, then essentially used that image as a guide to model the shape of the reproduction. Visually it appears to be identical to the original, but of course I’ve never held the original in my hand. Now if someone could just ship the whole Studley chest to me… The original appeared to be stamped steel that was chrome or nickel plated, I made these in brass. Machining the body of the caliper is pretty straightforward. The real work was in the details. Once the parts were machined they had to be cut free from the blank, the little retaining tabs sanded flush, the holes de-burred and re-tapped, and the faces hand sanded with 600, 1000 and 1500 grit sandpaper to make sure they look nice. Then the real fussy work started. Because of the small size of these, off-the shelf hardware is too big. 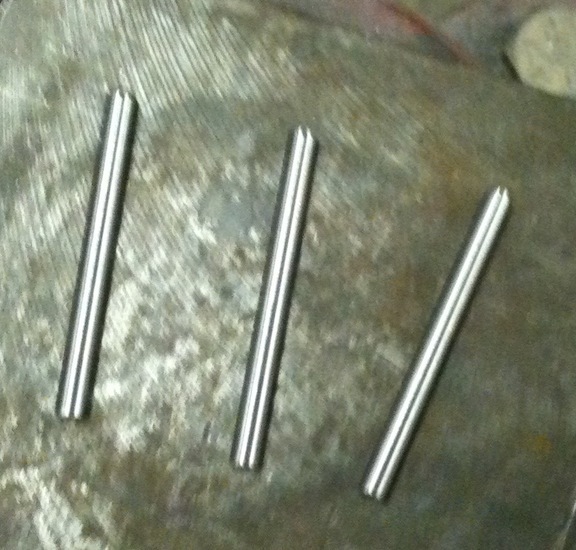 The pivots are small binding posts with #8-32 threads. 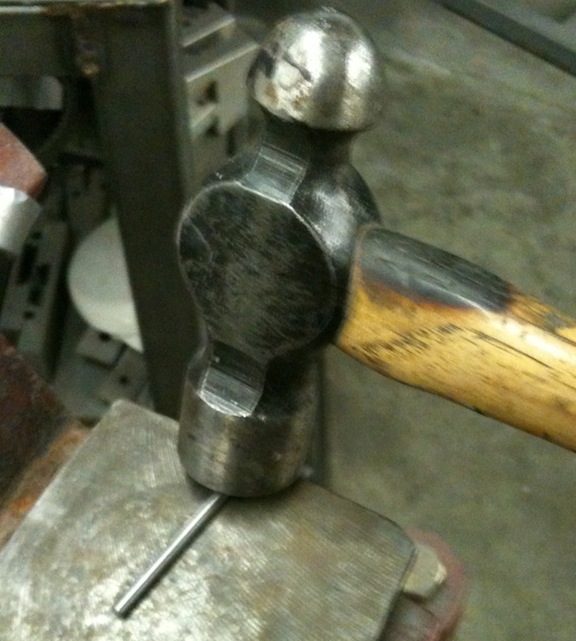 Both sides of the pivot and the base of the thumbscrew needed to be machined for clearance. 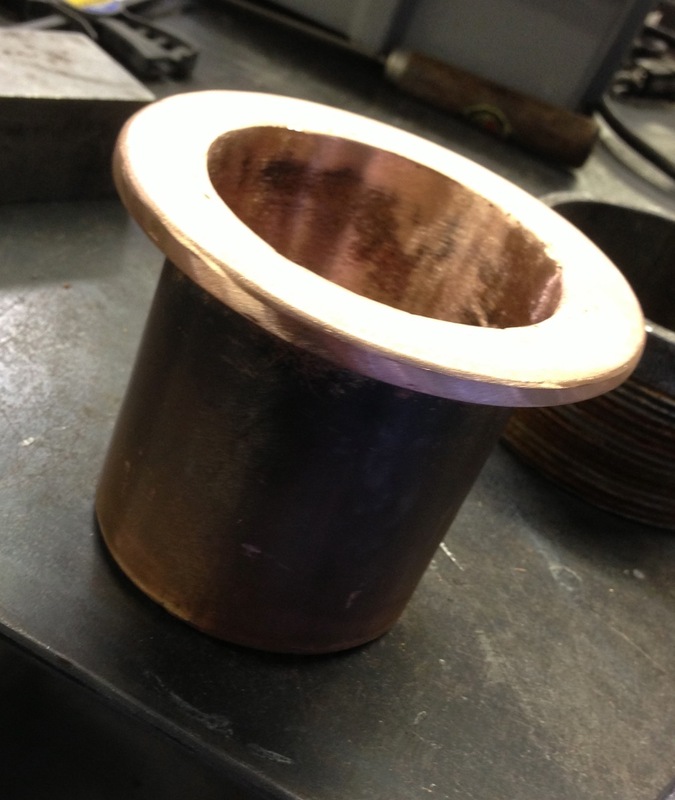 And of course clamping tiny brass screws in a collet tends to distort the threads, so I had to run a die over all the threads to clean them up. Luckily Kolya was a willing participant. Once all of the fasteners were machined, re-threaded and everything cleaned we turned up the music in the shop and assembled them. If you want one the only way to get one is to attend the Handworks conference in Amana, Iowa on May 24-25 and buy one from Lost Art Press. I’m planning to attend, hope to see you there! I just looked at my new saw bench in the light of day. I like it. Milk paint rules. Holy cow. Another week of work craziness. I work at a big software company, and the product I work on has been under fire for the last several months. We’re had lots of meetings with execs, lots of planning meetings and several emergency software updates. Including one this past week. Typically it takes at least three or four weeks to test and release a new version of the software, so doing it in two or three days is a nightmare. The upshot of all of this is, and the tie-in to what I wanted to talk about (besides my silly little saw bench here) is it’s effect on my ability to do things outside of work. After a week of high pressure activities it sounds like a wonderful thing to be able to go out in the shop and make something. And in more typical times it is. But in reality it’s hard. I find that my mind isn’t at all focussed and I make really dumb mistakes. Things I should (and do) know already trip me up. 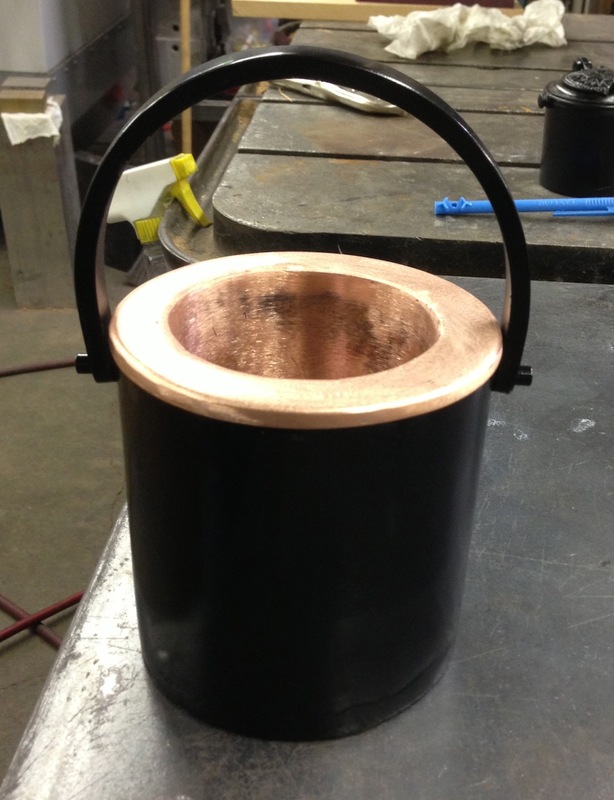 Simple projects are the best for times like this, but even simple projects can be frustrating. That the other part I guess, not only is my focus off on vacation somewhere, but it took my patience along for the ride. Am I the only one that experiences this? I’ve tried taking some time off (last Friday, in fact) but guess what? Work emergency. 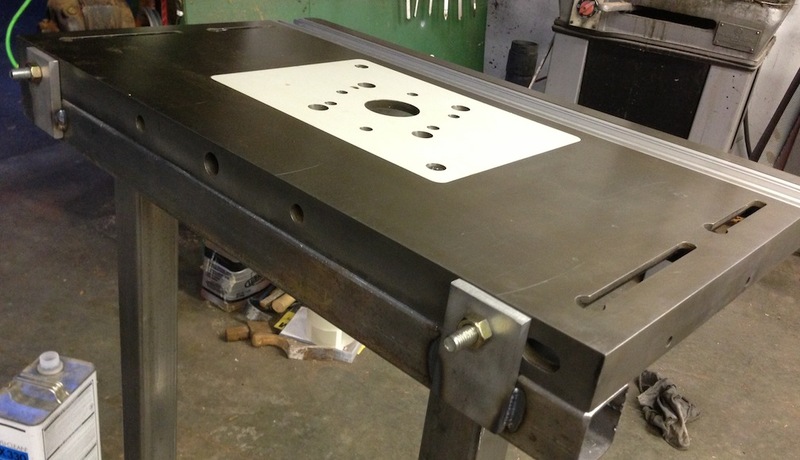 So yesterday I had to feed parts into the CNC mill for a side job, and decided to make a saw bench. 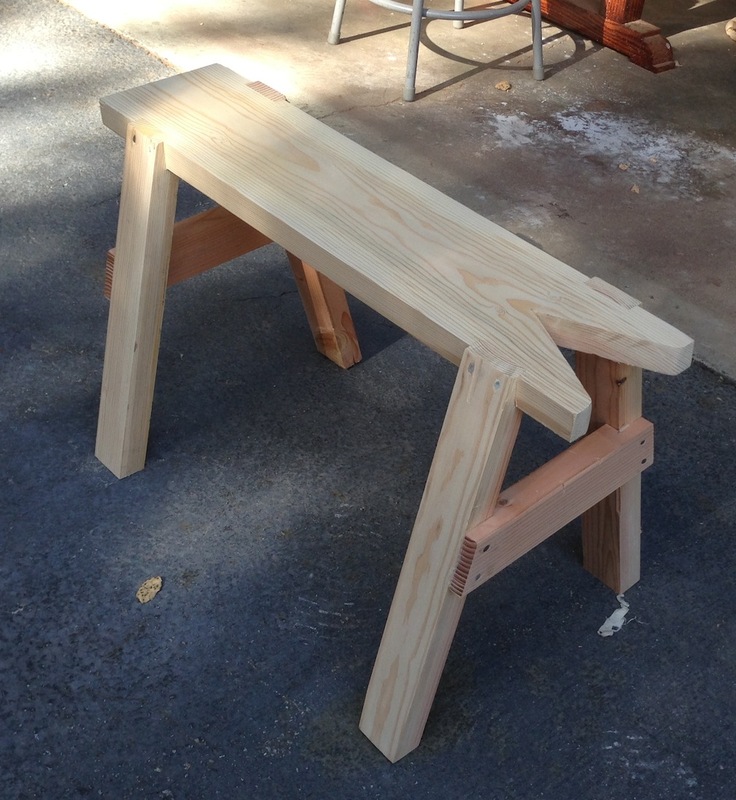 Christopher Schwarz has published, videographed and blogged about more varieties of saw bench than is probably healthy. 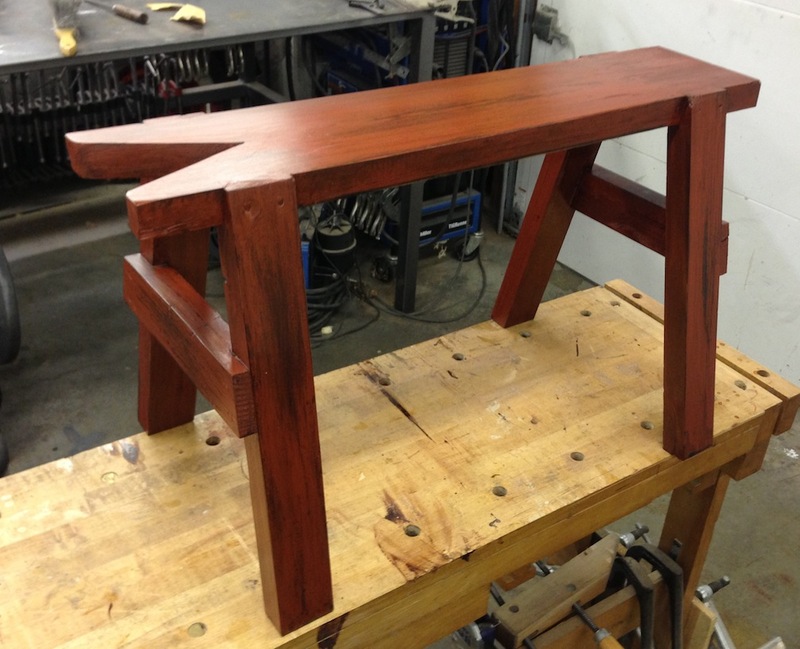 I used one of his bench designs as the starting point, although I left off the long stretcher. The material came from a home center 2 x 8 that I cut up several months ago. I dimensioned and trued the legs, then laid out the notches for the tops. So far, things are going reasonable well. I got a slight taper on the very end of one leg from careless plane work. I also trashed one piece when I over did it removing a out of square edge and the part was too narrow. That’s the kind of mistake I was talking about earlier. I don’t claim to be a great hand tool woodworker, but with a clear mind I can dimension something like this without a lot of angst. Sawing the notches was frustrating, mostly because of my crappy workbench. The vises on it don’t hold well at all, so the part is wiggling around while I’m trying to saw it. I tighten the vise more, it holds just enough to convince me it will be stable, then shifts in the middle of a saw stroke. 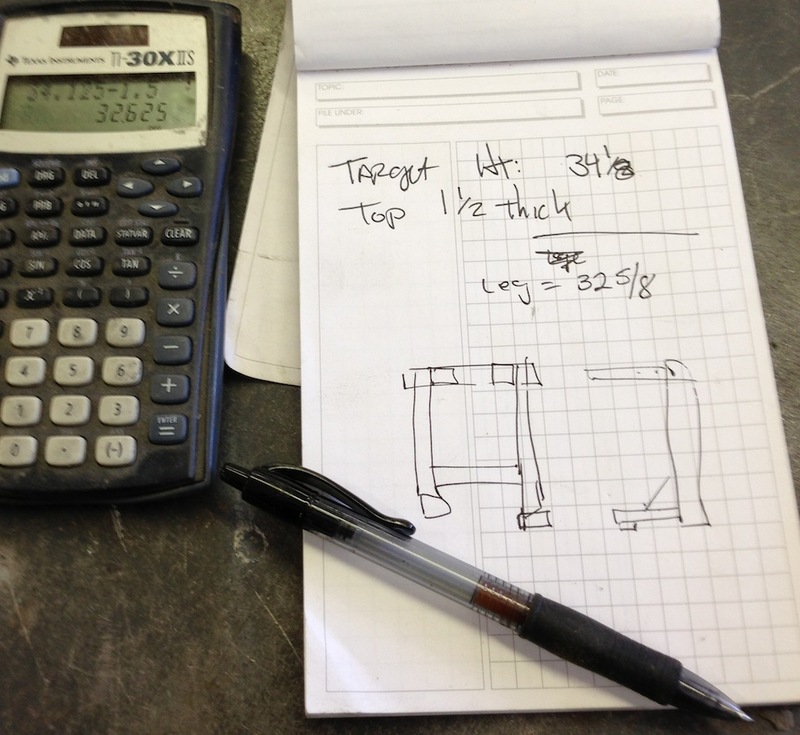 I need to work on my workbench project, but I’m put off by dimensioning the stretchers for some reason. Maybe I’ll bite the bullet today. Anyway, I flattened the board top and cut notches for the legs. The top had a huge cup and it took some work to get rid of that. But I think I’d rather deal with a cup than a bow or twist. Twists drive me crazy, and on a day like yesterday it would have been too much. After I cut the notches I glued and nailed the legs in place. One of the legs was angled slightly off. I should have checked the bird mouth notches side by side to make sure they were consistent. Sigh. 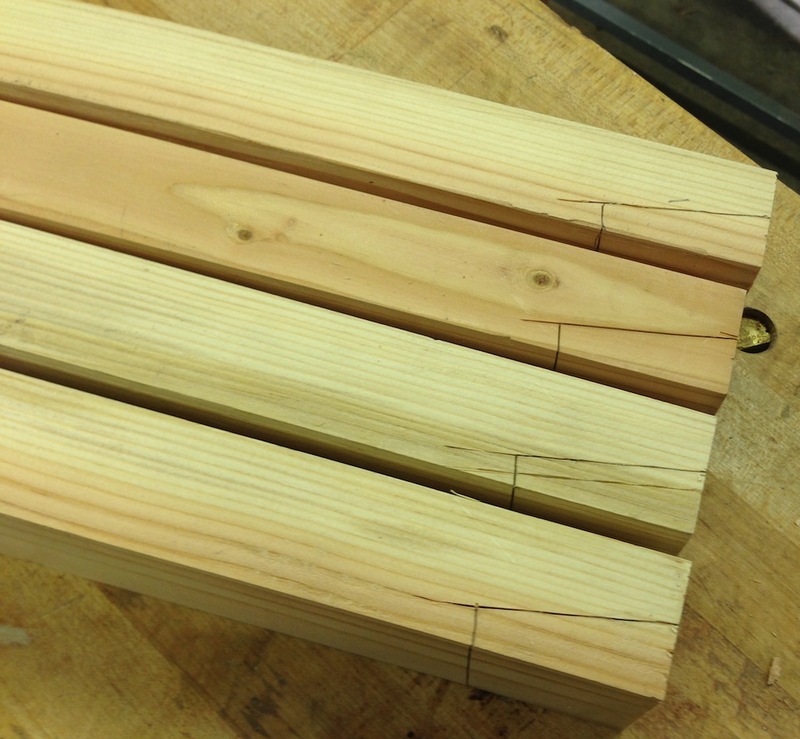 I marked out and cut the half-laps for the short stretchers, then glued and nailed them in place. And of course one of the split even though I drilled pilot holes for the cut nails. Sigh, again. And yes, it would have been better to put the stretchers on the inside of the legs so there would be more clearance for the ripping notch. So, it’s not terrible, right? I’ll make a better one someday when my head is clearer, but it’s functional. After I scribed and trimmed the legs it sits nice a flat and should be just great for crosscutting small boards. I need to make another one so I can work with longer boards. Since I had time I decided to try out some milk paint I bought on a whim a while back. 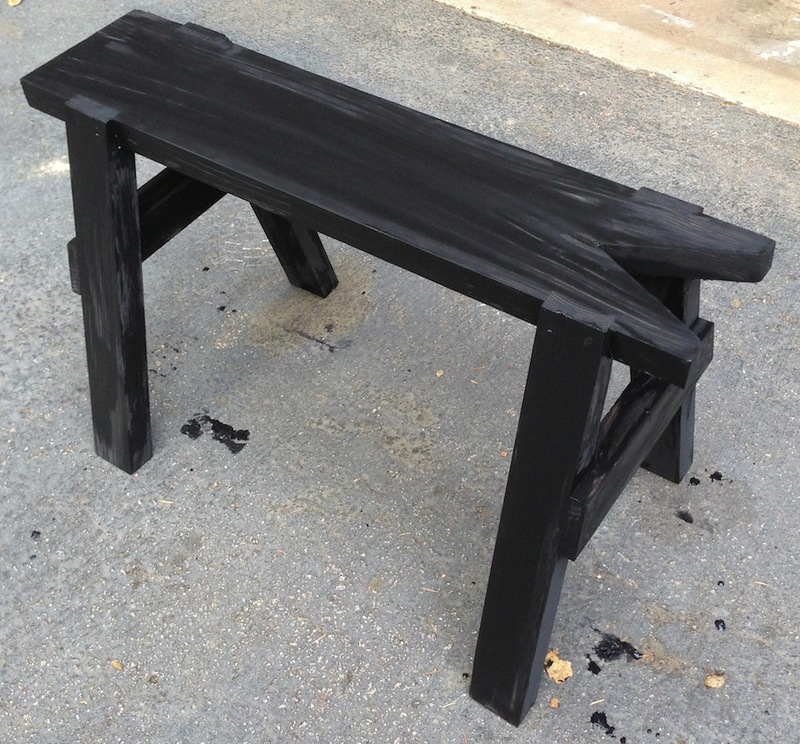 I gave the bench a coat of black as a base coat. After the black had dried I sanded it with a 320 sanding sponge. It sands really nicely. I mixed up some Salem Red for a top coat. I think I had it mixed a little thin as it didn’t cover quite as well as the black, but I wanted the black to show through anyway. 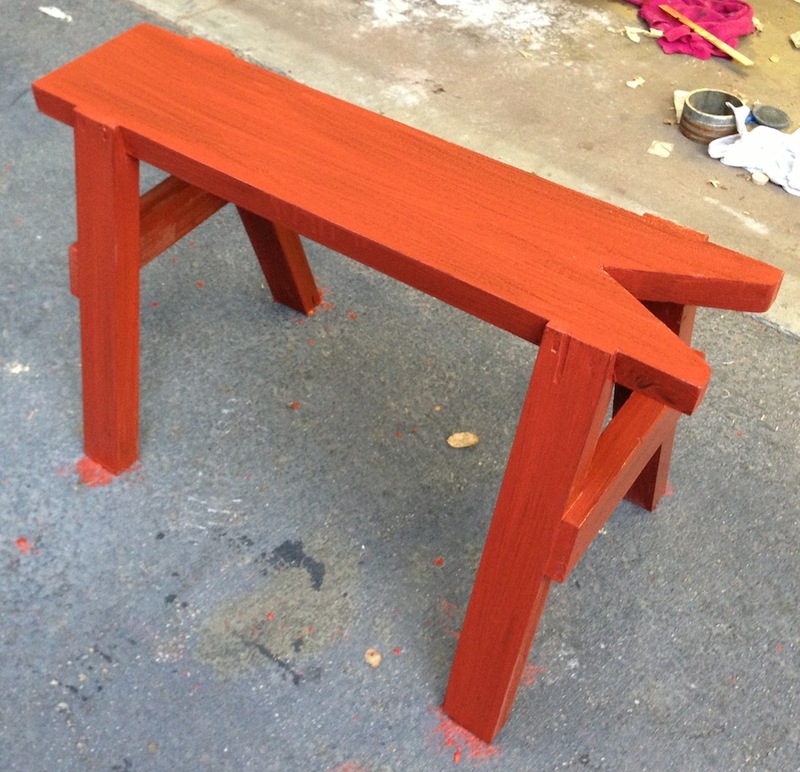 I sanded the red top coat after it dried, and then applied a coat of Tried & True Oil/Wax mix. It really darkened the color nicely. I like it. A while back I started making a marking gauge. I really like my Glen-Drake gauge, I like the way that it slices through the wood and leaves a crisp line. I’ve seen marking gauges that use small blades and even X-Acto knife blades. The downside of that approach is that the attachment is a bit more fiddly. I wanted this to be simple and fast, here is what I came up with. 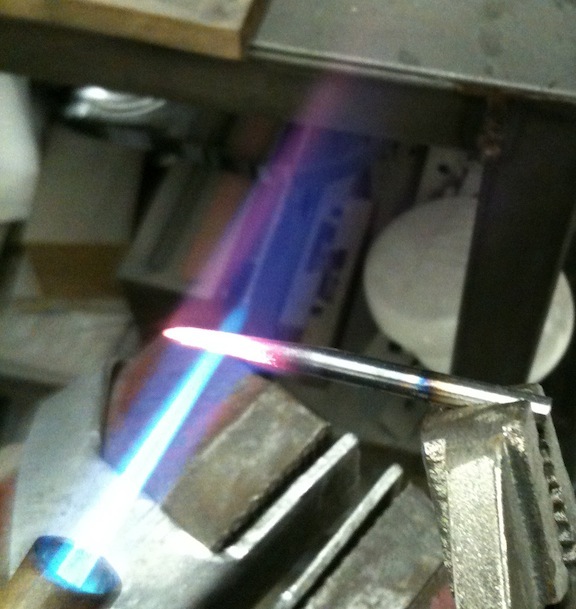 I heated the rounded end using a propane torch, the hottest part should be right at the tip of the inner flame cone. I’m holding it a little too far into the flame in the picture, but I’m juggling the part and the camera at the same time. 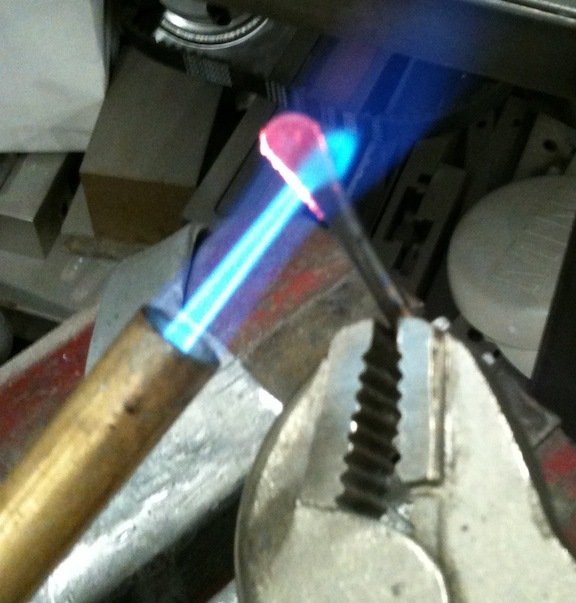 Heat the tip until the first 1/3 or so is a cherry red. I’m going to forge the end into a flat, fan shape. Forge might be too strong a word, this is pretty light work. I used light taps and re-heated it after a few taps. 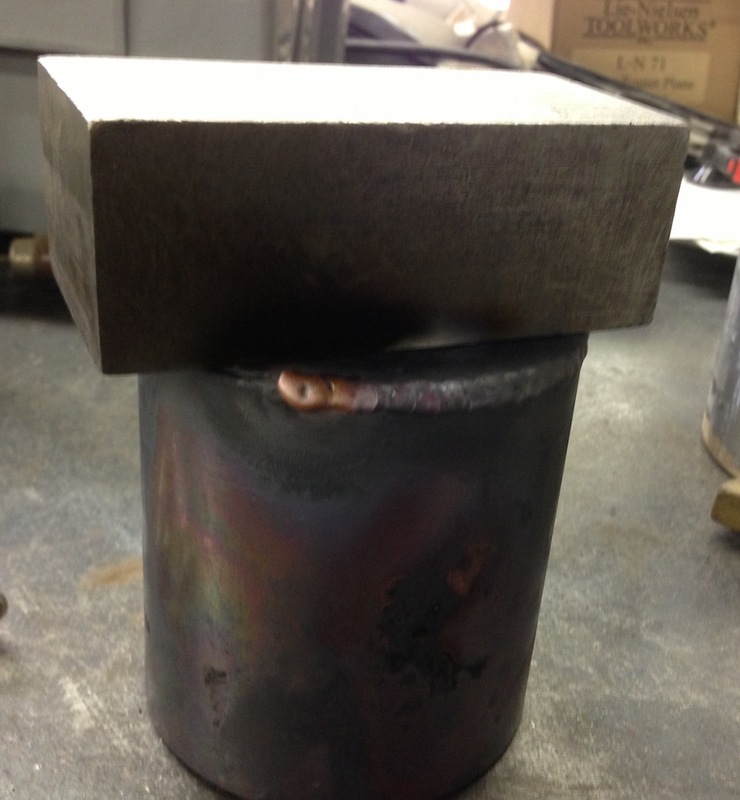 Between the small size of the part, and the mass of cold metal in the hammer and “anvil” it cools off really quickly. To get the shape I wanted I need to hold the hammer at an angle, and hold the part at the edge of the anvil so that the hammer can hang off the edge. This is a posed shot of course, I couldn’t hold the hammer, vise grips with the red-hot part and the camera all at the same time. 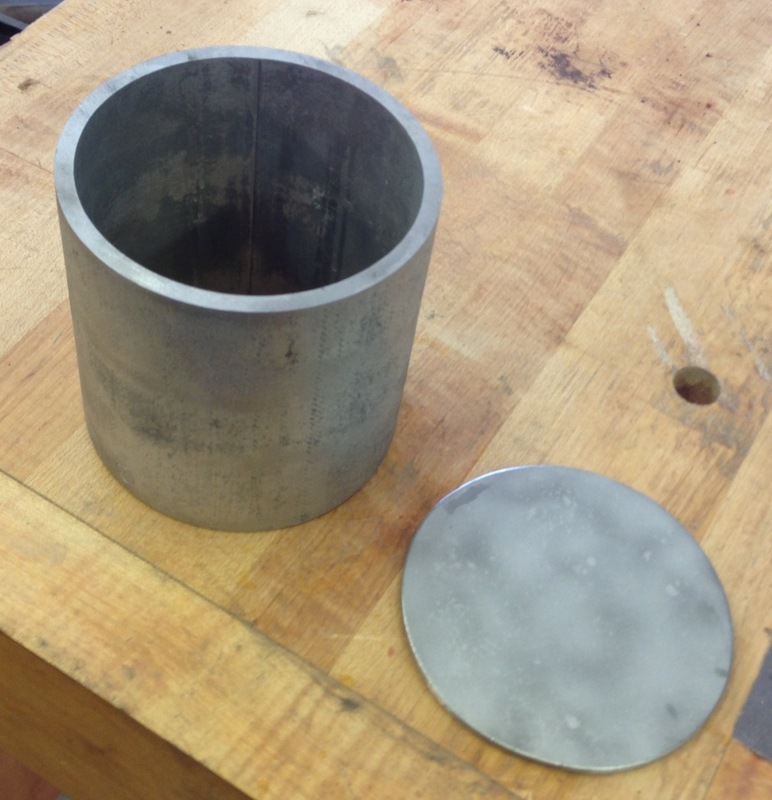 What I’m working toward is to thin the metal at the tip, tapering back to a round cross section, while widening the metal at the same time. It’s harder to type than to actually do it, trust me. It took me maybe 3 or four cycled of heating and hammering to get to the shape I wanted. Next I needed to harden the metal so it would hold an edge. 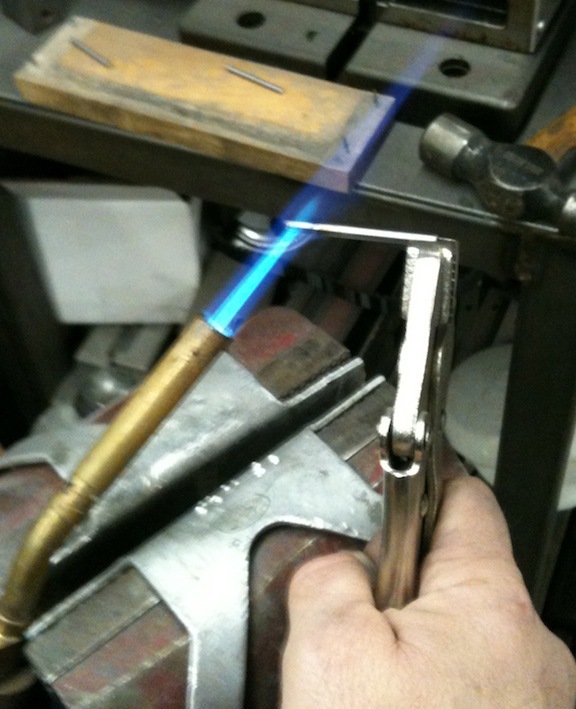 There is a lot of science in heat treating, and a fair bit of black magic when it comes to making edged tools. I’ve forged a handful of knives and chisels in the past, forging edged tools is a bottomless pit of austenitic temperatures, molten salt baths and cryogenic cycles. 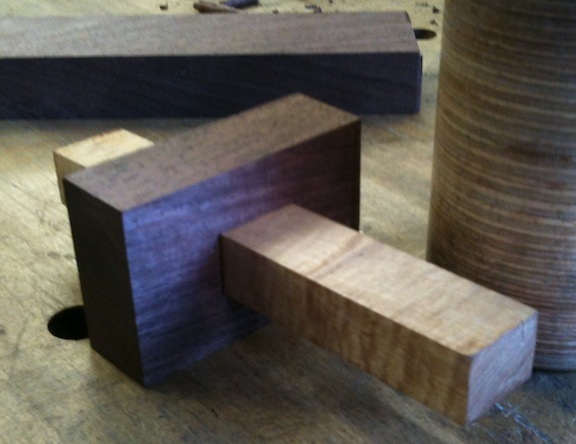 For the purposes of making a pointy thing to leave a deep scratch in a piece of wood, simple is fine. Heat the part to a medium cherry red. 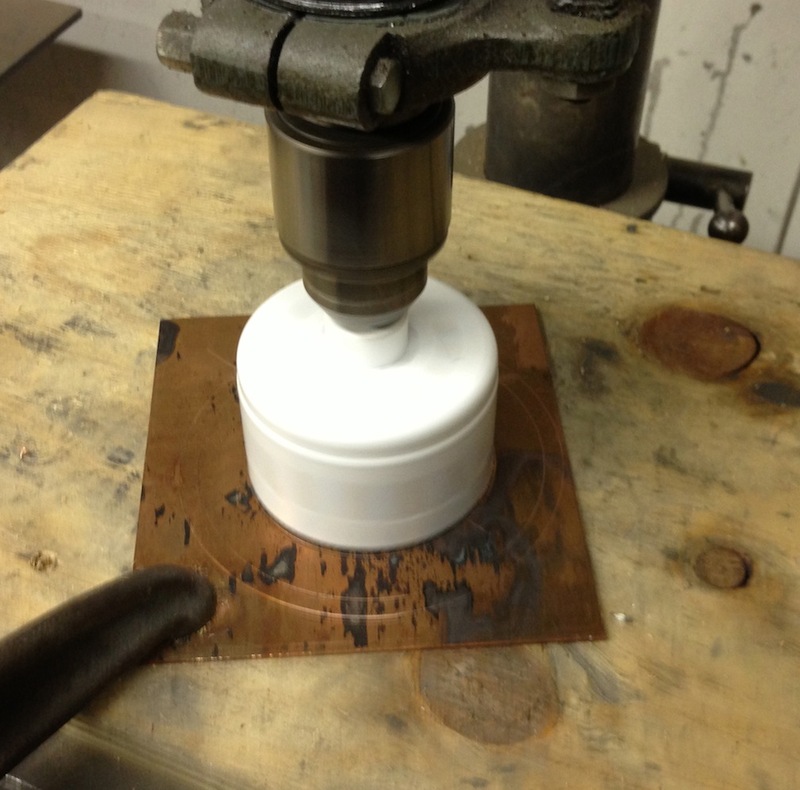 If you have a magnet handy the part should loose it’s magnetic attraction at this temperature. 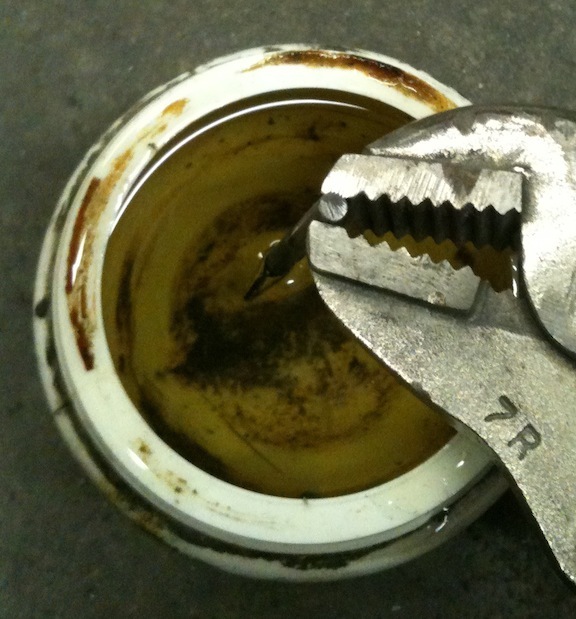 Then stick the part into a small container of oil and swish it around. Done. Technically it should be “tempered” to draw out the brittleness, but it’s not necessary for this. Please use caution if you do this yourself, it’s all too easy to burn yourself or set something on fire if you’re not careful. You can confirm that you’ve hardened this by using a file. A slightly dull file (I have several of those left over from retoothing my saw) should skate across the hardened area without cutting. 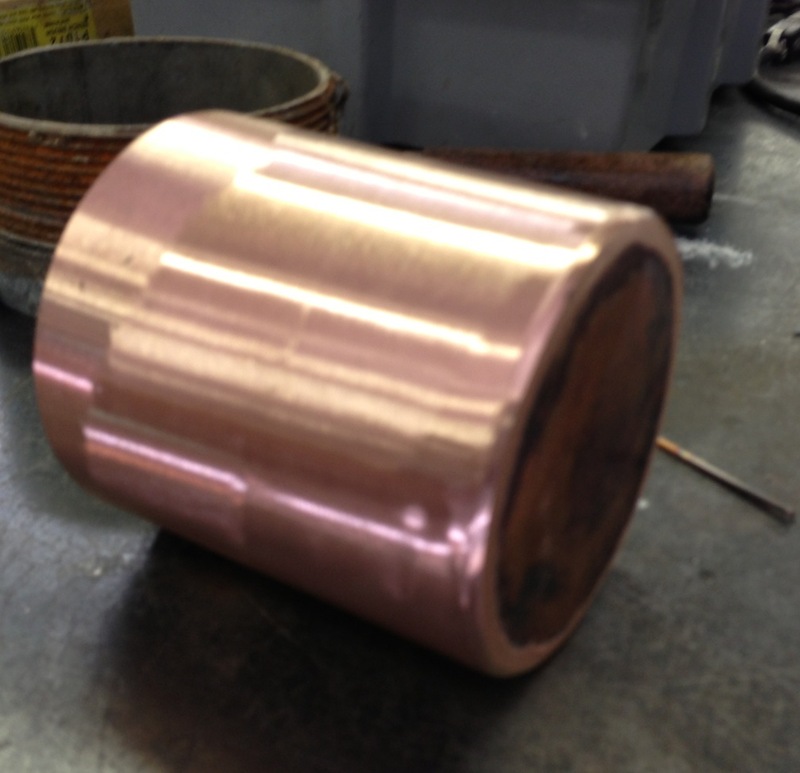 Compare it to a piece of the same material prior to hardening it. 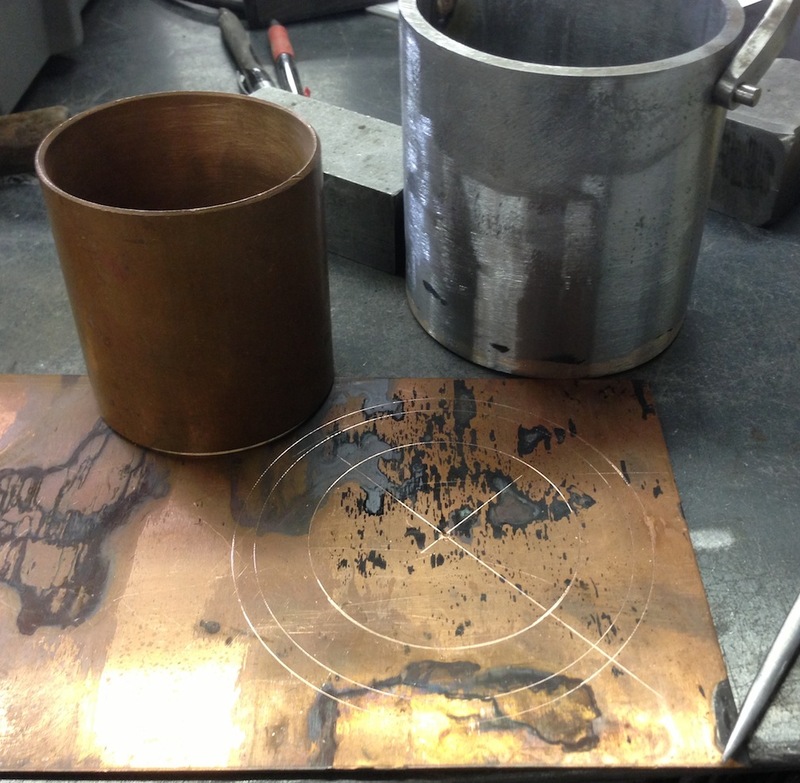 Then I worked the tip with a grinder, then an oilstone. 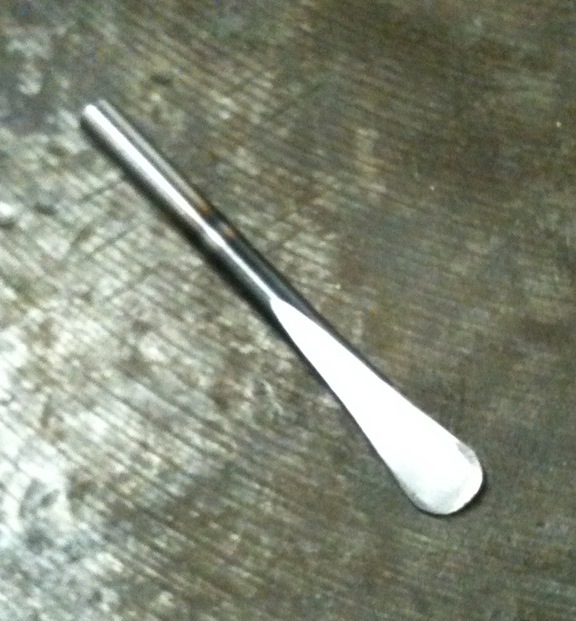 The tip is wide and thin, less than 1/16″ at the edge. I still need to sharpen it, and finish the rest of the marking gauge, but I think this will work out well.